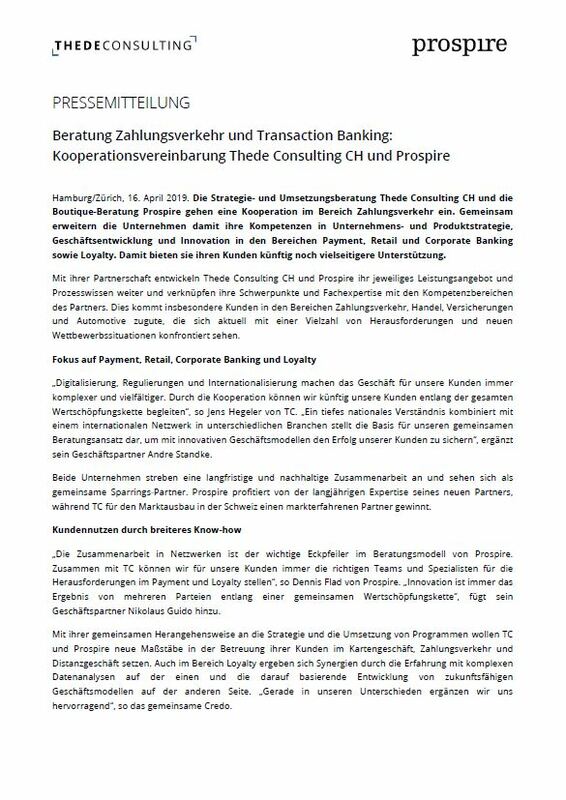 Thede Consulting CH and Prospire cooperate in their consulting strategy and become sparring partners in Switzerland in payment and transaction banking. TC CH and Prospire thus extend their respective competencies in corporate and product strategy, business development and innovation. With a focus on the areas payment, retail and corporate banking as well as loyalty, we will provide our clients with even more versatile support in future. With our cooperation, we further extend our service offering and process knowledge and jointly combine our core competencies and expertise. This is specifically beneficial for our clients in payment transactions, retail, insurance and automotive. Those industries are currently facing numerous challenges and new competitors. „Digitalisation, regulations and internationalisation currently lead to a more complex and diversified business for our clients. Our cooperation with Prospire means that we can now accompany our clients along the entire value chain”, says Jens Hegeler from TC. „An in-depth national understanding combined with an international network in various industries is the basis for our joint consulting approach. This way, we can secure our client’s success with innovative business models”, adds his business partner Andre Standke. Together with our sparrings-partner, we aim for a long-term and sustained cooperation. More information on Prospire here.